One of the reasons I always suggest for people to take a tour of Florence (and the other major historic cities) is that you can learn so many interesting things about the history of the monuments and the city itself. When walking the streets of Florence there are so many beautiful buildings to admire that often people just pass them by, without even noticing the particular architectural features and certainly unaware of their historical significance. Except for the major monuments, most visitors don’t realize how many of these lovely palazzi have a story to tell. Due to its particular façade, this building might stand out when walking down Via Maggio. Known as the Palazzo di Bianca Cappello, it was built between 1570 and 1574 by the architect Bernardo Buontalenti, on the foundations of the original structure dating from the early 1400s. However, it’s the story behind the building that makes it unique. Commissioned by the Grand Duke of Tuscany, Franceso I de’Medici, for his mistress, Bianca Cappello, a Venetian noblewoman with whom he had fallen madly in love. He chose the site especially for its proximity to the Pitti Palace, his official residence, making it easy for him to visit his lover frequently. Their affair proved to be one of the most scandalous of the Renaissance period – as Francesco was married to Giovanna of Austria, and Bianca to Pietro Buonaventuri – who was (conveniently?) murdered on the streets of Florence in 1572. 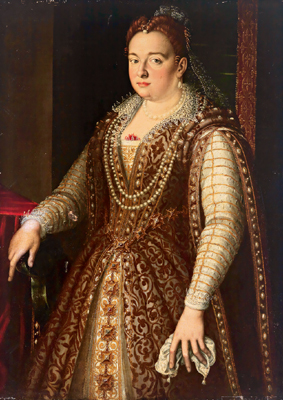 After Giovanna’s premature death, Francesco was able to marry Bianca in 1579 and she then moved into Palazzo Pitti. Yet their story did not have a happy ending, as the Medici family was opposed to their relationship from the start and it is suspected that the couple’s death at the Medici Villa in Poggio a Caiano only 8 years later (and within hours of each other) might have been the result of poisoning. 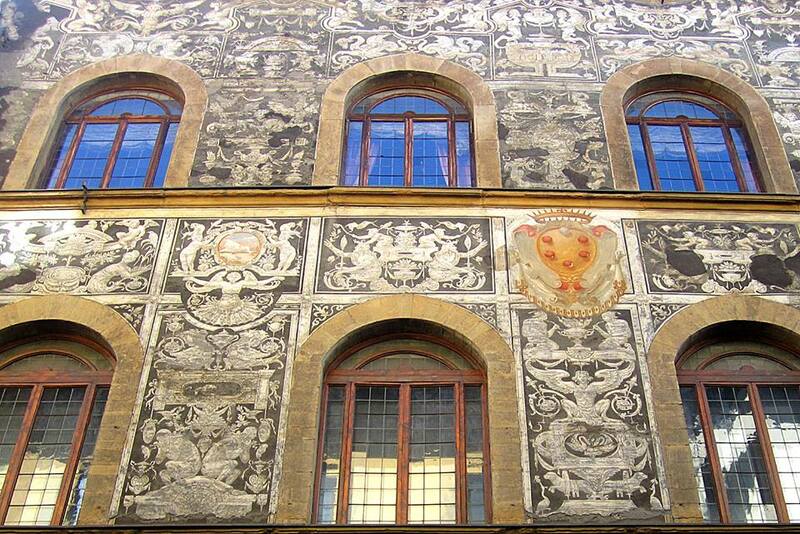 The palazzo had been donated to the Hospital of Santa Maria Nuova when Bianca became grand duchess and it was then that the façade was painted with this particular decoration called sgraffito by Bernardino Poccetti. Today, the building belongs to the city of Florence and is used as an archive for the scientific and cultural institute Gabinetto Vieusseux. 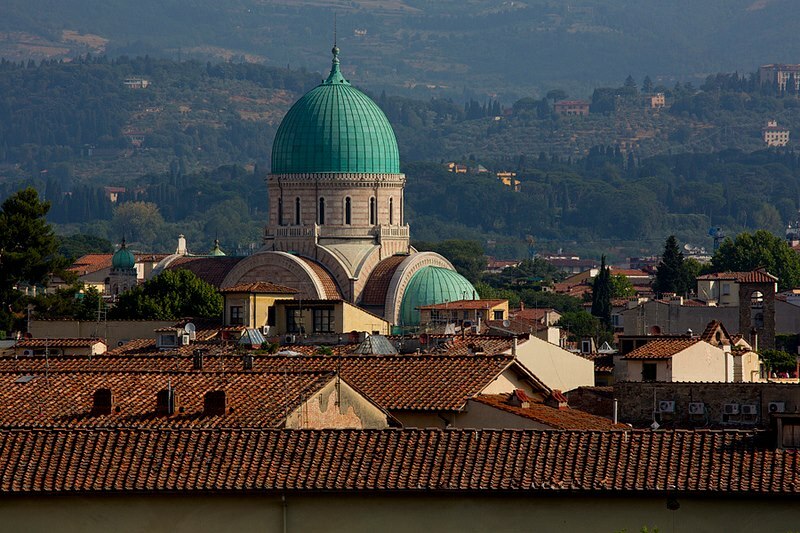 High above the red roofs of Florence there is a large green dome that dominates the skyline to the East of the historic center. This is the city’s synagogue, built between 1874 and 1882 thanks to the large donation left by David Levi, president of the Hebrew University, to construct a place of worship for Florentine Jews, "worthy of the Renaissance city". 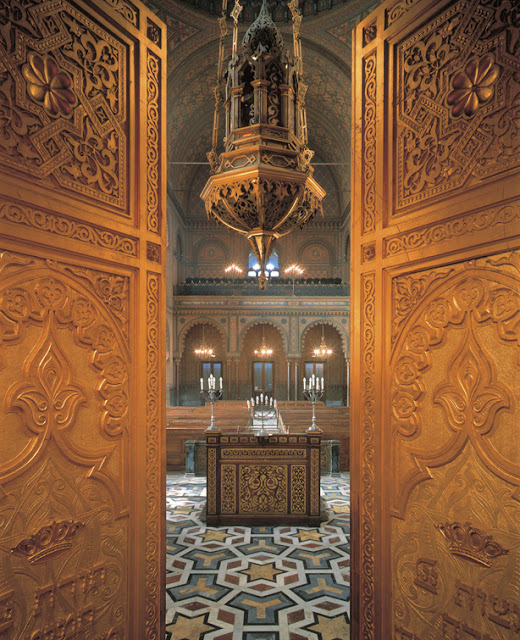 The project and its realization were a tribute to Florence’s progressive nature at the time, with the joint effort of both Christian and Jewish architects resulting in an impressive example of eclectic architecture that reflected a variety of styles: Moorish, Byzantine, Arab, and Florentine – fused to create a unique and beautiful building. 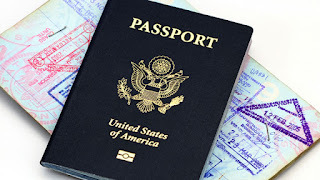 The history of the Jewish community in Florence probably dates as far back as the Romans. Initially they lived in the area between the Ponte Vecchio and Piazza Passera. However, in 1571, Cosimo I commissioned the construction of a Jewish ghetto in the area near the old market (now Piazza della Repubblica). It was not until 1848 that the ghetto was opened, and only in 1870, with the unification of Italy, was it finally demolished. This event led the Jewish community to look for a place to build their synagogue and a plot of land was chosen in the Mattonaia quarter, a new area of the city between Piazza D’Azeglio and Piazza Sant’Ambrogio where expansion was in full force at the end of the 19th century. Today, the synagogue remains an active religious and cultural center for the Florentine community. 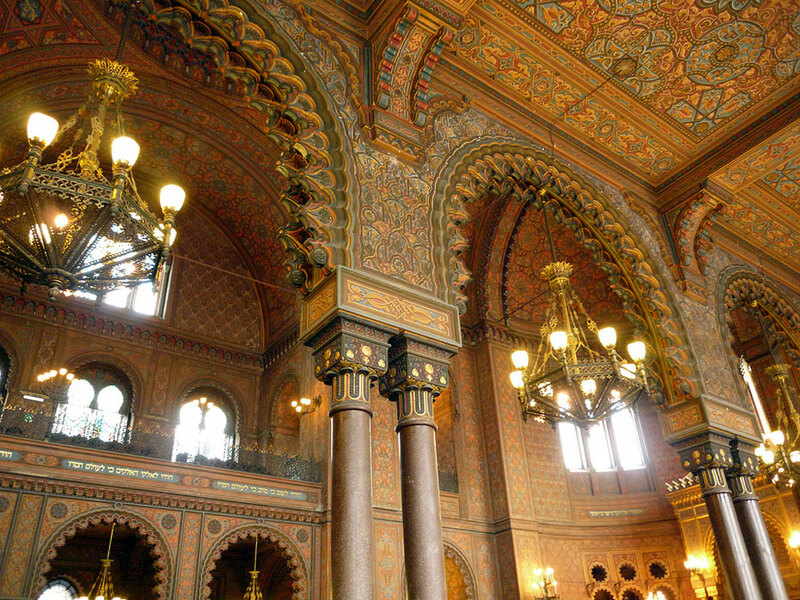 It represents one of the most beautiful Jewish temples in Europe and is very much worth a visit, both from an artistic and a historic point of view. There is also a museum where you can learn about the history of Florentine Jews and view religious artefacts dating back from the 1600s.